The city of Bangalore was not always the city we know today. Interestingly the city was divided into two parts, civil and military portion. The two portions were welded together in 1949 within a common corporation. Before coming together of these two-part, each part of Bengaluru had its own municipality and had different collectors. The municipality was headed by the collector. The collectors were appointed to collect revenues and to take care of law and order in the city. Bangalore had an assemblage population of 29,21,751 in 1981. While corporation area of the city had a population of 2476355 in 1981. The city’s population saw a increase of 70 percent in between the years 1971 and 1981. Bangalore is a place that had a number of prehistorical settlements. The race course, Jalahalli and Byrasandra are places of historical importance. Many tools from the Neolithic period have been found in these places. Dr Shikaripura Ranganatha Rao, an archaeologist said that it is possible that the rock at Basavangudi was a prehistorical habitat. The name of the city has also been found in an inscription in Kannada found in a close proximity of Begur temple. The name is considered to be as old as the ninth century. The name of the city is considered to have a link with Benanchu kallu but there are many other stories related to the name of the city. 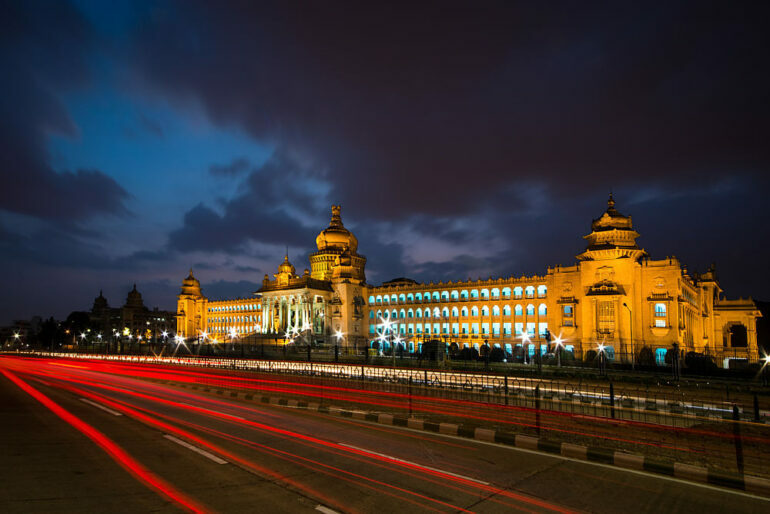 It is said that the name Bangalore originated from Benda Kala ooru(the village of boiled beans). This name was explained by the Hoysala king Ballala. But the pieces of evidence contradict this theory as the name is ancient than the king Ballala. According to the Ganga record, the place Bengaluru is a hamlet. It is now known as hale Bengaluru. The story behind this is that when Kempe Gowda 1 established the new town in the year 1537, he named it Bangalore. Since his mother and wife both hailed from Hamlet Bangalore. The city has also been referred to as ‘city auspicious’ or Kalyan Nagare. The fort of Kempe Gowda has been totally demolished but the places such as Yelahanka Bagalu (Mysore Bank Square) and Halsur Bagalu are still present. The town was later conquered by the sultans of Bijapur and Shaji Bhonsle in the year 1638. And the Mughals took over the city in 1689. In the later years, the city was ruled by Haider Ali and then by Britishers. After the Britishers took the control of city the Cantonment area grew significantly as a distinct township as the British troops were shifted in the city. The current day Airforce hospital served as the first camp for the British troops in 1806. The Cantonment areas witnessed the construction of a large number of magnificent buildings in the city. They were all constructed in European style. The present town Chamraja Wodeyar and Dewann Seshadri Iyer were then called Chamrajpet and Sheshdripuram respectively. These towns were renamed in the year in 1892. In the year 1898 other major extensions were added in the city called Basavangudi, this name originated from the Bull temple located in the Sukenahalli village. Another extension was Malleshwaram, it was named after the Kadu Malleshwara temple in old Mallapura village. So next time you plan to visit Bangalore keep the interesting facts about the origination of various cities in mind. Are Ranveer Singh and Deepika Padukone Really Getting Married?